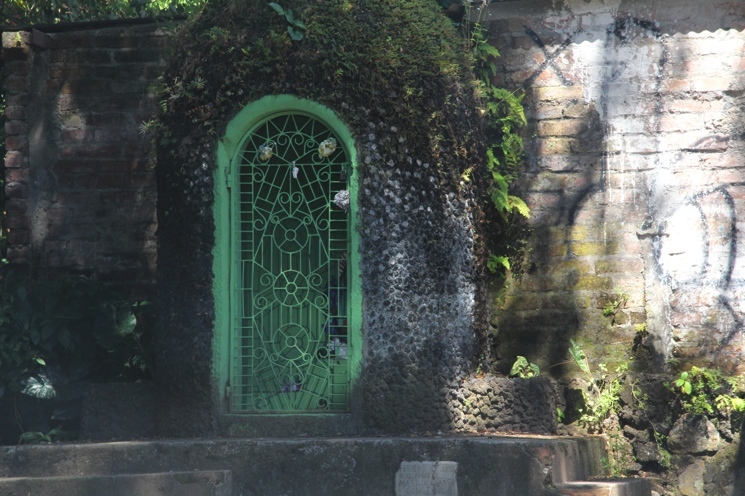 Throughout El Salvador windows and doors tend to be covered in metal grillwork, but the examples in Suchitoto were definitely antique-looking, formidable, but yet lovely. One assumes the utilitarian purpose of the iron work is for security. The contemporary metal window covers used now do not begin to compare in craftsmanship or quality with the original wrought iron. 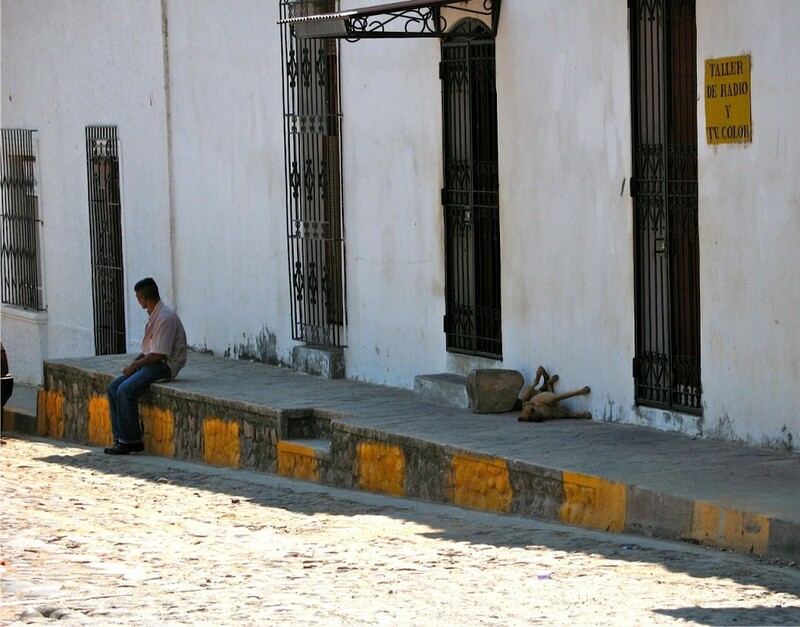 Seeing the short video clip entry in Tim’s Blog on Thursday, February 7, 2013 entitled “El Salvador – 60 Years Ago” by Burton Holmes, circa 1954, got my attention. Within it was a segment on the craft of fashioning decorative wrought iron by students in Tecla’s College of Santa Cecelia. The claim was that throughout Latin America there was a ready job market for artistic designers of wrought iron. Prior to traveling to Latin America where I saw it used to cover windows and doors, my exposure to wrought iron was limited to the plethora of decorative uses in cemetery fences, gates, trellises, arbors, stair and balcony rails, gazebos, and planters. My curiosity got the best of me as I began researching wrought iron. When and where did it begin? 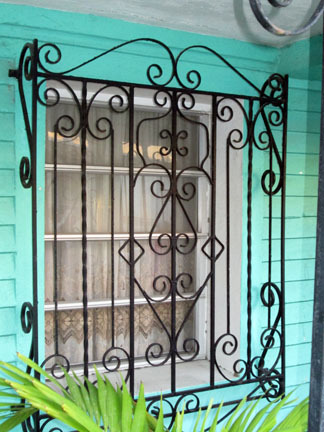 Is wrought iron In New Orleans’ French Quarter different from Spanish designs? Is it still produced? Following is a SHORT synopsis of my findings. Ancient Egyptians are believed to have used iron as far back as 5500 B.C. Around 600 B.C. iron was used for weapons and tools. Wrought (“worked”) iron which is composed of iron and glass-like slag was hand forged by using hammers and other devices by blacksmiths during the Middle Ages. The blacksmith once was considered as important in a town as the doctor because he magically transformed a coarse material into something breathtaking. Wrought iron was used functionally during Roman times to tie together beams of bridges, canals, or domes of churches. Actually covering doors and windows with wrought iron is a concept used during medieval Europe to prevent attacks from raiders. It is prevalent in cherished landmarks including Paris’ Notre Dame and England’s Winchester and Cantebury Cathedrals. Benedictine monks in Spain were known to have created decorative leaf motif iron screens to protect their church treasures. Art and architecture followed the ancient trade routes through Venice with wrought iron styles being no exception. There was often a blending from the Moors, Arabs, and Gothic styles as methods were shared and taught throughout the known world of the time. As one might expect, each country and culture tended to put its own unique stamp on the wrought iron designs it used. During their Baroque period, the French used very elaborate, stylized designs comprised of twirls, loops, and swirls. It is that tradition that the Creoles in New Orleans attempt to replicate on their Victorian balconies covering an entire façade in a lace-like veil. Sometimes the wrought ironwork there link buildings together or define boundaries. England, Belgium, and other European countries began to also use wrought iron following in France’s footsteps. The Spanish, which would be the basis for most Latin American countries’ uses including El Salvador, began using wrought iron in the 13th century for the cathedrals in their major cities. By the 14th century blacksmith guilds were increasing in popularity and architects were adapting the features of the designs and coming up with their own differentiated styles. Examples typical for Spanish wrought iron were to use a number of evenly spaced vertical bars which gave the double advantage of better protection of their church valuables while allowing better visibility by the worshippers. This quickly became the accepted convention in Spain. They also were partial to using a “round bar” style rather than a square bar which they often placed on the diagonal. Often entire church pulpits were made out of wrought iron. When steel was introduced as a cheaper alternative, wrought iron fell out of favor. In 1974 the last iron works ceased production. There is still a company in England that rolls a limited amount of “puddle wrought iron” which is used solely for restoration and conservation projects. Wrought iron work is still considered a timeless tradition and a highly skilled craft done by very few crafts persons who preserve landmarks of historical significance. Lay persons would have difficulty telling the difference between true wrought iron work and cast iron. To the naked eye there would be little difference noted between wrought iron and mild steel. However, steel contains carbon which corrodes. True wrought iron is known for its quality and weathering properties. Exterior wrought iron in centuries old pieces in Europe still stand. It is doubtful that blacksmithing/ fashioning wrought iron remains in the curriculum of many technical or trade schools in El Salvador like it was in the 1954 video I referred to earlier. That craft has been replaced by other trades not even conceived of on the job market sixty years ago. Yet there is a certain romantic mystery and beauty to a craft that is no longer made. It makes finding those rare, existing pieces that much more of a treasure.